Jenifer Brening was born in 1996 in Berlin, Germany. She became famous through her participation in the first season of the Sat.1 talent game Show The Winner is ... and the 11th season of "Deutschland sucht den Superstar". According to her parents, Jenifer Brenning sang before she could even speak. At the early age of five Brening took up four years of ballet training. She had her first big performance at the age of eight at her mother's birthday, where she sang the song "Für Dich" by Yvonne Catterfeld. After this experience of performing at her mother's birthday, Jenifer started taking piano lessons. She has been performing at family gatherings and has uploaded her selfmade videos to YouTube. In 2010 she entered into a regional singing contest called "Heidenheim sucht den Superstar" and won the competition. Furthermore, in 2011 Brening participated in the Bravo Star 2011 and was in the top 10. In 2012, she participated in the first season of the Sat.1 talent game show The Winner is ... with Dutch presenter Linda de Mol and German Turkish music producer Mousse T as jury, she was narrowly defeated with 45 to 56 points by the winner Onita Boone who was second in the overall standings. After focusing on her YouTube channel and her fans for a few years, she then in 2014 participated in the 11th season of "Deutschland sucht den Superstar". On December 31, 2013 Brening's first solo single "Not That Guy" was released, which won her the EMMaward 2014 for Best Newcomer 2014. An acoustic version was produced by the German-Swedish producer duo Eike & Kaz. Her second solo single "A New Me" was released on January 5, 2014. Her third single "Alive" was released on January 14, 2014. All three songs were written and produced by Stefan Moessle and Mathias Strasser. Her brand new single 'Remember' is out now by KHB Music. 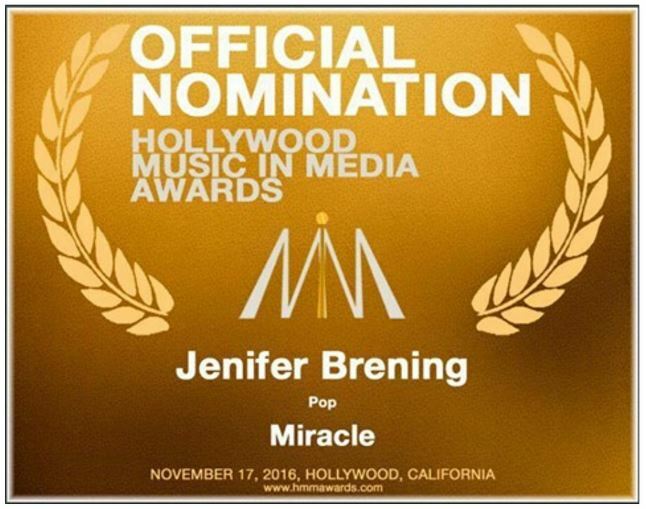 Jenifer has also been nominated for the 'Hollywood Music In Media Award' in Hollywood, California, which will take place on November 17, 2016. We wish Jenifer all the best and good luck! !